The Chrysler V8 6.2L HEMI engine is exclusively available for the Hellcat series of Challengers and Chargers. As we have with previous blocks, Arrington provides additional displacement to produce even more power and to make better use of the Hellcat supercharger. 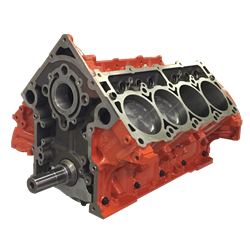 This is THE Arrington 426 HEMI Stroker short block - HELLCAT edition, the foundation for the ultimate Hellcat builds. Based on the Chrysler 6.2L HEMI block, all of the moving parts are upgraded and forged to create a high-performance platform for maximizing the Hellcat supercharger, going with aggressive camshaft profiles, and other modifications.